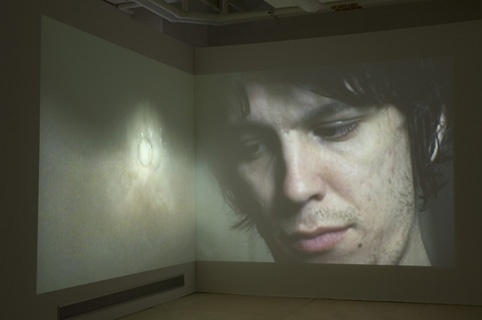 The video installation Werther consists of two projections, projected adjacent to each other at a 90-degree angle. 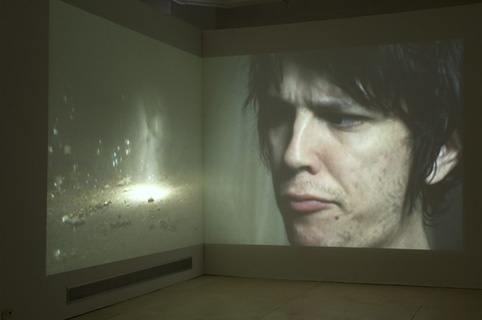 On one side is a video with bubbles and smoke blowing in dark rubble floored basement lit only by a single light that casts a circle on the floor. It is a seamless loop of subtle beauty and a sense of loss, two common party machines blowing against each other and magically transforming the basement into a lunar landscape that is so foreign yet familiar. Bubbles float into the cone of light, and drop in its center with a tiny explosion before they disappear. A big smoke cloud blows in, diffuses the light, bounces off the bubbles, and dissolves into wisps floating away before the space is still again. 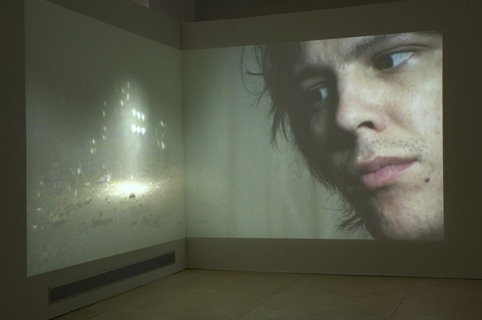 This might be the place that the young man’s face in the other projection is yearning for. His expression is ever changing and intense. Watching him is to witness an intimate moment; he is unguarded, not playing to the camera, completely within himself. He grimaces, closes his eyes, glances over to the space next to him, his mouth twitches, and he raises his head.